Tell me the name isn't tempting 😉😉? I was wondering how this cream would look and feel on the skin, given the so tempting name. I have used this cream with a lot of caution and for around 15-20 days. Read on to know how this one fairs and which skin types it will suit. If you are in a jiffy head to The In and Out section directly. 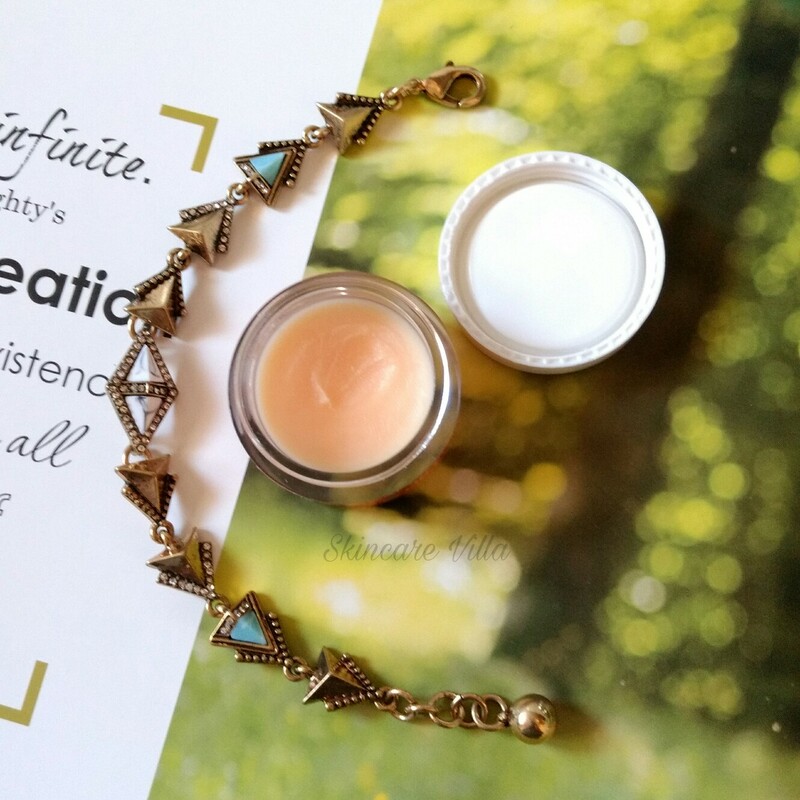 With Almond, Manjistha and Aloe Vera this nutrient rich cream is easily absorbed by the skin. Ensures both corrective and preventive action, minimizes fine lines, delays signs of aging and restores firmness and radiance. Ideal for normal to dry skin. Ingredients - Aqua, Sesame oil (Sesamum Indicum), Bees Wax, Stearic Acid, Glyceryl Monostearate, Vegetable Glycerine, Almond Oil (Prunus Amigdalus Duicis), Aloe Vera oil, Manjistha oil, Tea, Caprlyl Glycol, Phenoxyethanol, Fragrance, Borax, Zinc Oxide, talc, BHT. 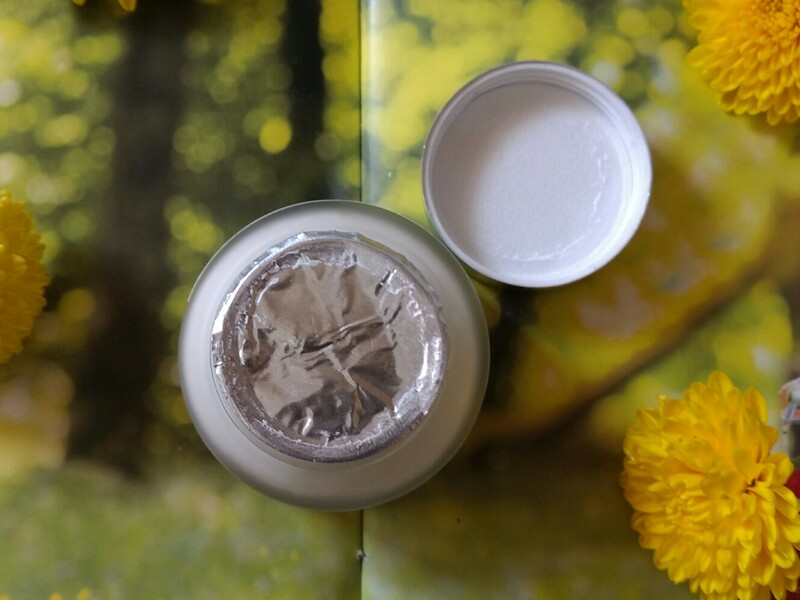 The cream is packaged in a glass jar packaging with a silver twist cap and had a foil on top of the jar. The jar isn't heavy and the shape of jar is such that it can easily fit into a handbag. The cream is white in colour and has a heavenly almond fragrance. The fragrance is a bit lingering and remains for some time after applying the cream. The fragrance is very subtle and is exactly that of an almond oil. The Bajaj almond oil fragrance you can say 😉. Now coming to the texture of the Almond Nutrifying cream, it is a thick cream with waxy consistency. The cream is a bit heavy and needs to be massaged well into the skin. The cream spreads easily on the skin and leaves a subtle waxy feeling behind. If we apply the cream in excess, it doesn't feel oily. 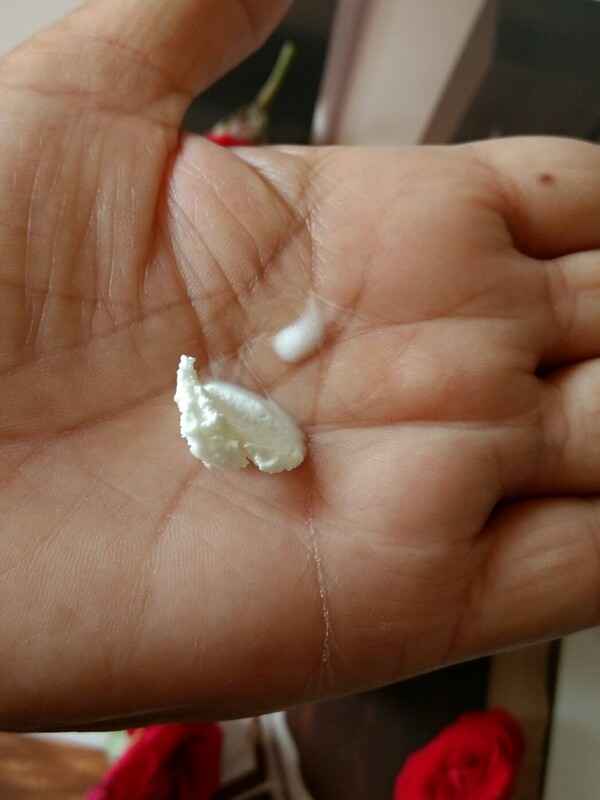 A very less quantity of cream is required for those with oily skin. Dry skin and normal skin beauties, it depends on how much you use for every use, but this won't make your face oily for sure. After applying the cream I felt fresh and rejuvenated. 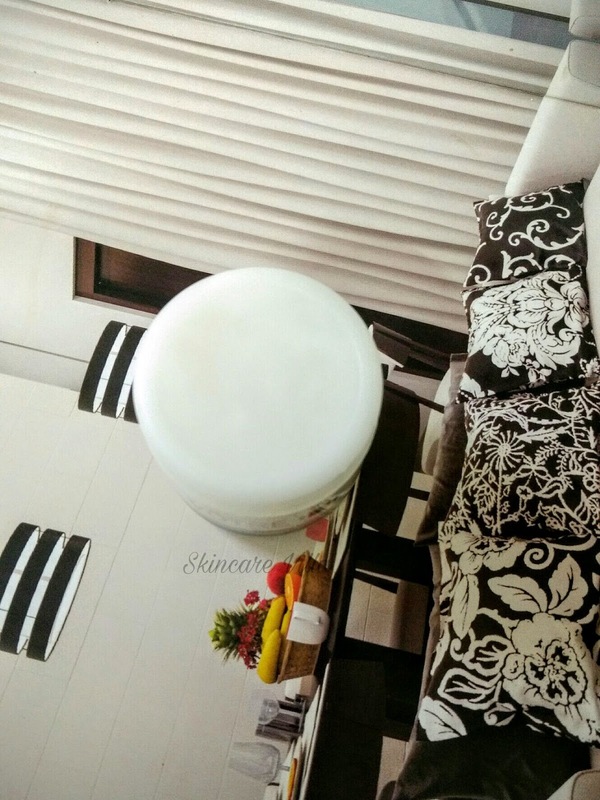 The cream hydrates and moisturises the skin sufficiently. 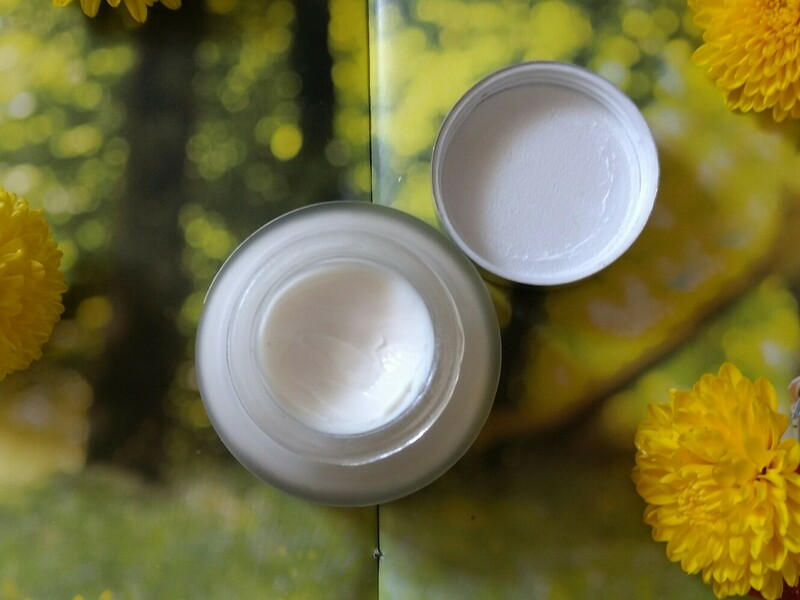 The facial skin doesn't become plump and even toned after applying this cream. Skin feels a bit waxy and soft after applying the cream. The cream gives a feeling as if something is applied and when I run my finger over the face it feels waxy, not heavy though. Price, shelf life and availability - 495 INR for 50 gms with a shelf life of 2 years. Available on Athena Life website as well as major skincare shopping portals. 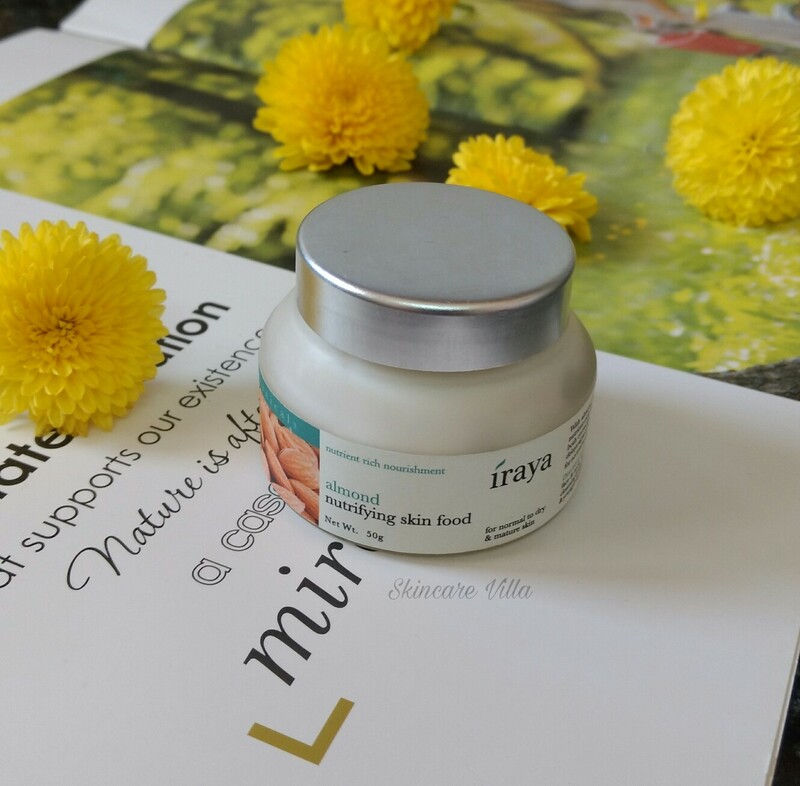 I would totally recommend the Iraya Almond Nutrifying Skin Food to dry, normal skin beauties who are looking out for basic moisturization. It is a good cream to try once in a while by all skin types, however oily skin needs to use very little. However, I am using it and as of now, it hasn't created any problems for me (I have oily, acne prone skin). I don't like the waxy feeling it gives post application. That is the only thing which bothered me, and if that is ignored it is a good cream to try for a change and for some almond nutrition 😉😉😉. Lip balms are a girl's favourite everyday essentials product. Tinted or normal ones we can never get enough of it. 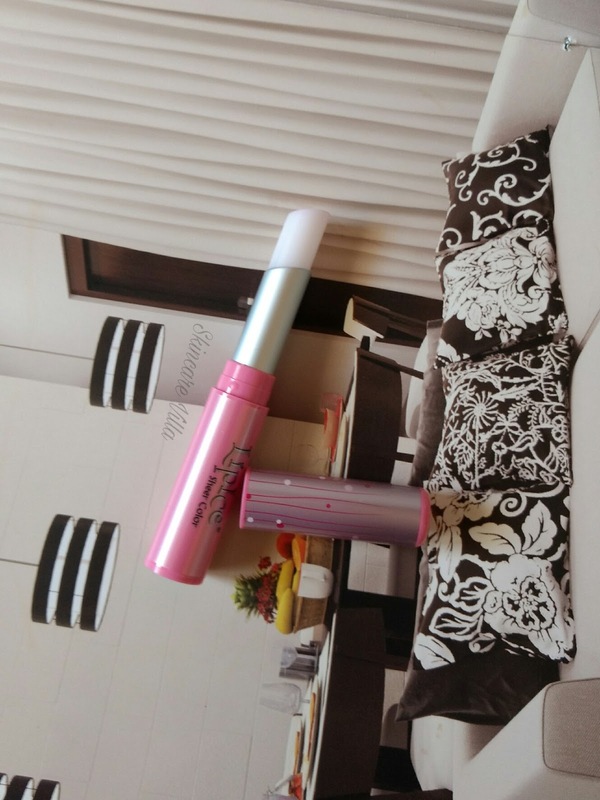 I love using tinted lip balms and have used Maybelline Baby Lips Spiced up till now. I am not much into lipsticks and so find tinted lip balms very handy to give a subtle shade of my pigmented lips. 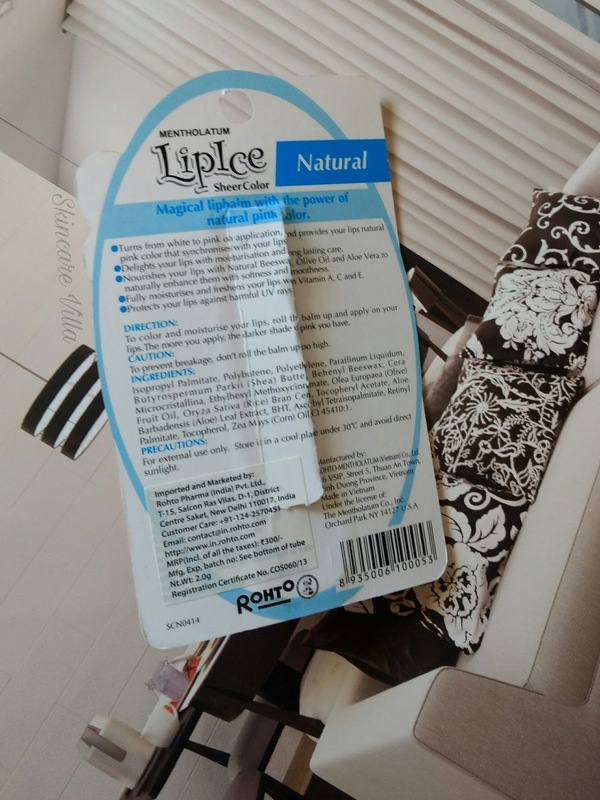 Today we will be talking about a colour changing lip balm from LipIce in the shade Natural. Let's head on to the review to know why this is a hit product in the market. The packaging is very sleek, luxurious and easy to use. The twist up and twist down mechanism works fine everytime I use it. The upper cap fits in tightly, so you can just stash the lip balm in your bag and you are good to go. Coming to the effects of the lip balm, the lip balm changes colour as soon as it comes in contact with the skin (lips to be specific). The lip balm looks like a normal opaque lip balm, as shown below, in the bullet. It changes its colour from transparent to baby pink colour in just 5 seconds approximately. The colour it imparts to the lips might change from person to person as well as from application to application. When I first tried, it was a slight dark shade of pink. And now while reviewing when I applied it is a baby pink sort of shade. The lip balms offers a nice 5-6 hours of moisturization, and once the shiny sheen of the lip balms fades, the colour becomes more prominent. Once the sheen wears off your lips look as if they are naturally pink. And I bet no one will guess, you have ever applied a colour changing lip balm. As for my pigmented lips, it perfectly matches both, upper and lower ones and my problem is solved temporarily. 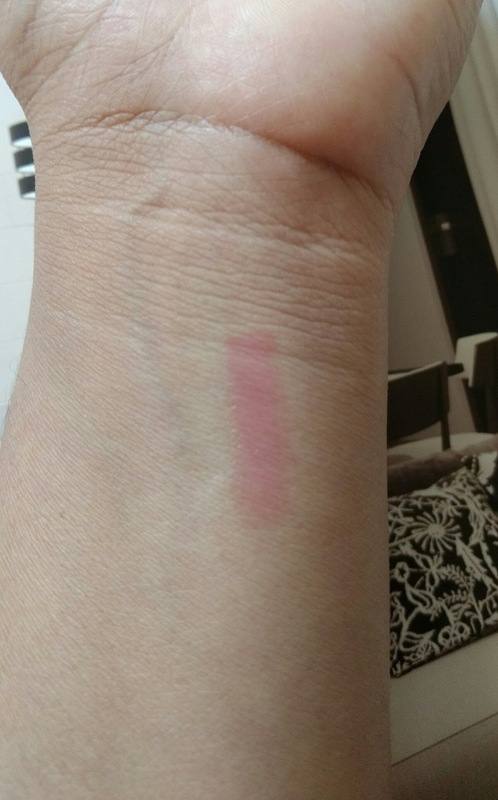 If you reapply around 3 swipes the colour will be darker, but after certain number of reapplications it stops changing the colour. And that's quite normal because it's not a fairy wand to make every wish of a girl true 😛😛😛. 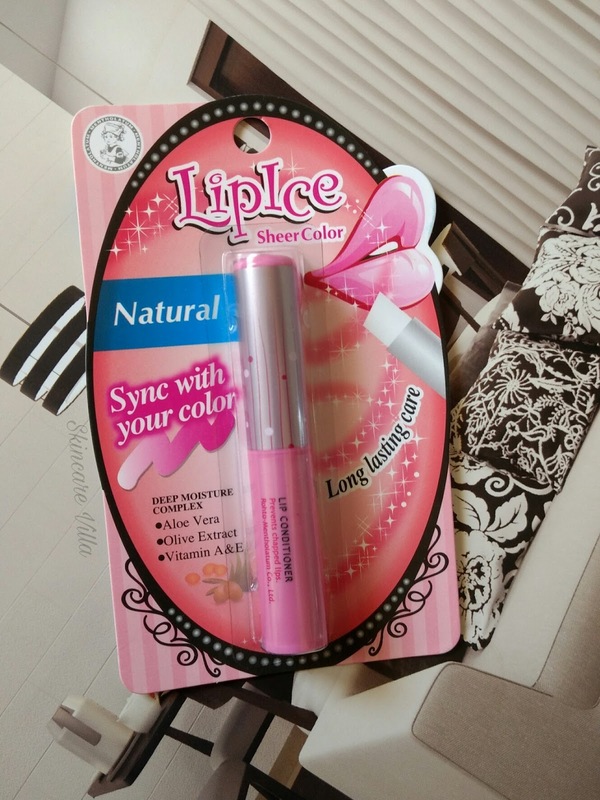 Overall a highly recommended colour changing lip balm from LipIce. Also read the below In things for loving this lip balm. Price, Shelf life and Availability - 300 INR with a shelf life of 3 years. Available on major shopping portals like Amazon. Yes , I would totally recommend the LipIce Natural lip colour for its effectiveness in terms of moisturization as well as colour imparting properties. It's a nice option for those who aren't into lipsticks much and still would like to give lips a nice shade. It effectively corrects pigmented lips (temporarily, of course). Moreover the formula is paraben and mineral oil free. What else we can ask for a colour changing lip balm to do!!!? 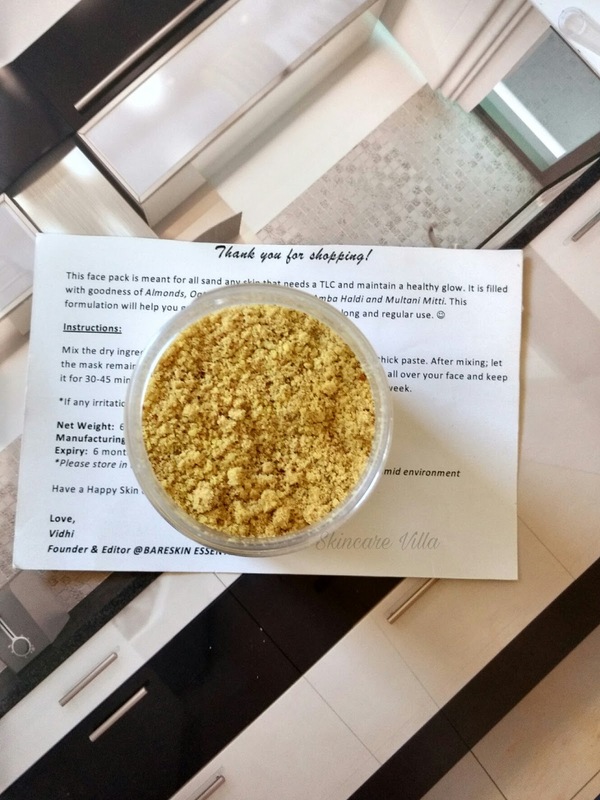 BareSkin Essentials is a blog as well as a brand by Vidhi V. I have been following her blog for quite some months and believe me you won't end up reading just one post. There are so many DIY skincare recipes on the blog that you will be spoilt for choices. 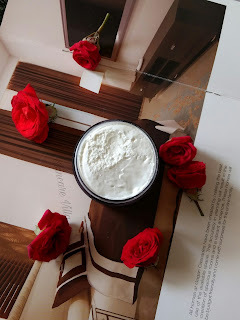 So the mask which am reviewing is born out of Vidhi's love for skincare and DIY. But yes, DIY doesn't mean mixing this and this, but using the right ingredients for a specific purpose. That's what Vidhi exactly does. 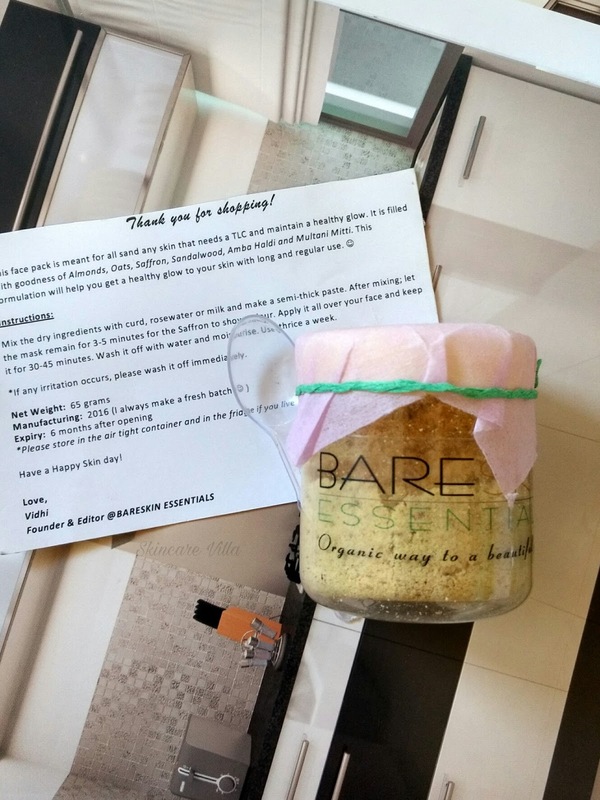 Let's head onto the review of the Skin Mask by BareSkin Essentials. 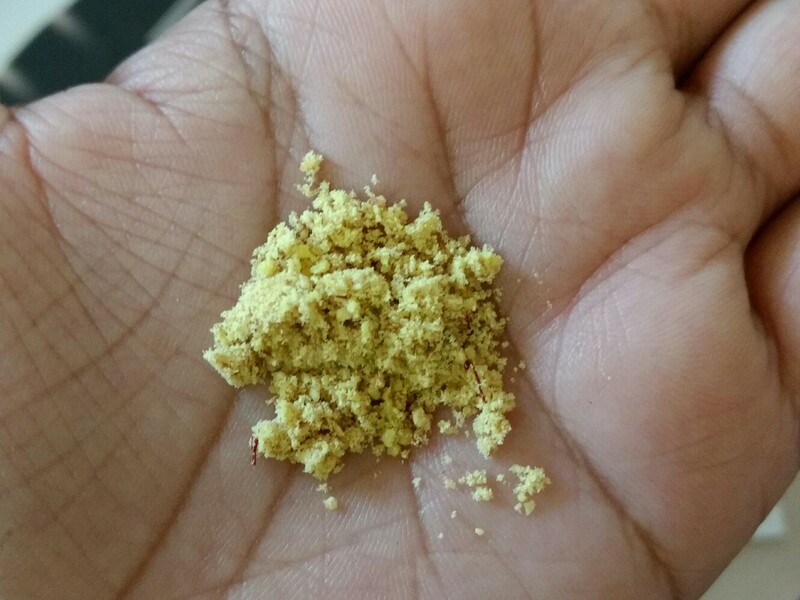 This face pack is meant for all sand, any skin that needs TLC and maintain a healthy glow. It is filled with goodness of Almonds, Oats, Saffron, Sandalwood, Amba Haldi and Multani Mitti. This formulation will help you get a healthy glow to your skin with long and regular use. 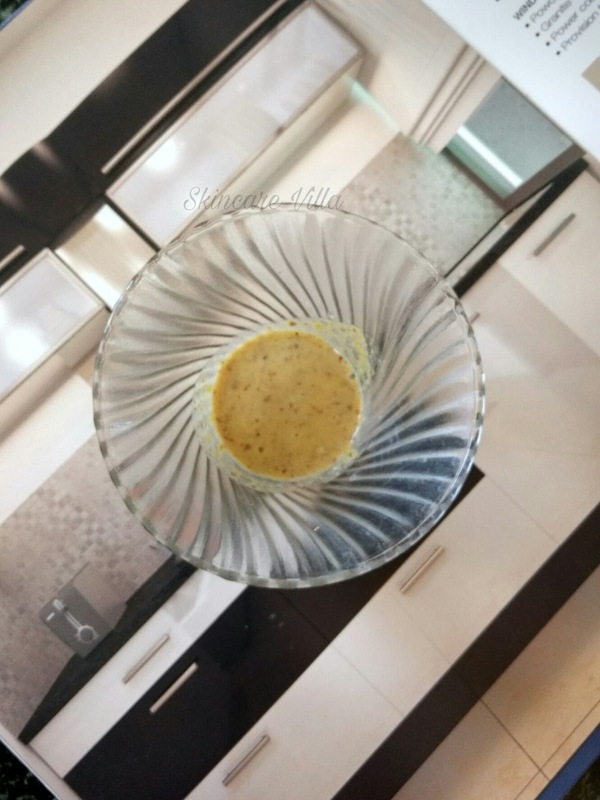 Directions for usage - mix with curd, rose water or milk and make a semi thick paste. After mixing let the mask remain for 3-5 minutes for the Saffron to show colour. Apply all over your face and keep for 30-45 minutes. Wash it off with water and moisturise. Use thrice a week. 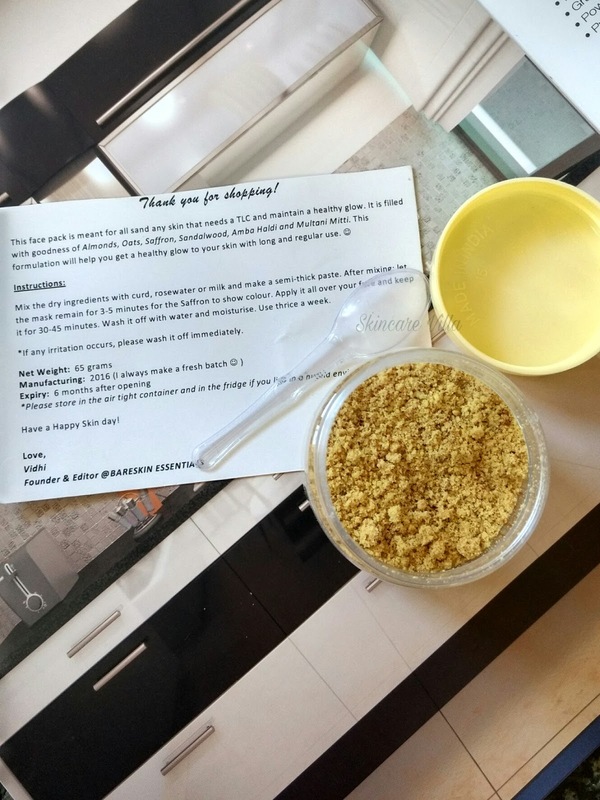 The mask is packaged in a simple plastic tub with a small accompanying spoon. The packaging is isn't any fancy but very simple. The mask is dry with all organic ingredients. We need to add milk or water to make a paste. Coming to the consistency of the mask it is very coarse, because it's hand pounded. The mask can also double up as an amazing, natural scrub. The mask has saffron strands in it, and I just jumped with joy when I spotted them. When I first applied the mask the ingredients were a bit big in size so I have put them in a mixer and grinded a bit. The fragrance of mask is exactly like the milk masala we put during Kojagiri full moon 😛😛, yummm yummm. The fragrance is very soothing and relaxing also. After using the mask as directed, I mixed it with milk and used. The mask takes a lot of time of dry up. While drying it starts giving stretchy feeling and in the meanwhile tightens the pores. The mask gives a glow and softness to the skin. It makes the skin even toned and smooth, so much that I couldn't keep my hands off my face, everytime I use it. I have used this mask around 3 times a week and thereafter once a week. I haven't noticed any lightening effects in acne marks, but since the brand doesn't claim the mask to do, I didn't even expect that. With regular use, the texture of my skin has improved, the sensitivity of my nose area has reduced considerably. All in all, a goto mask for skincare addicts who love indulging in organic and natural skincare. As we all know, with natural ingredients we need to be more patient but the effects are long lasting. I would recommend the BareSkin Essentials Healthy and Glowing Skin Mask to all who love using organic and natural skincare products. All the ingredients used are organic and natural. Unlike commercial ones it doesn't irritate my sensitive nose area. With regular usage it gives a soft skin 😊😊. NB - Product sent as a goodwill gesture in exchange of putting up brand advertisement. 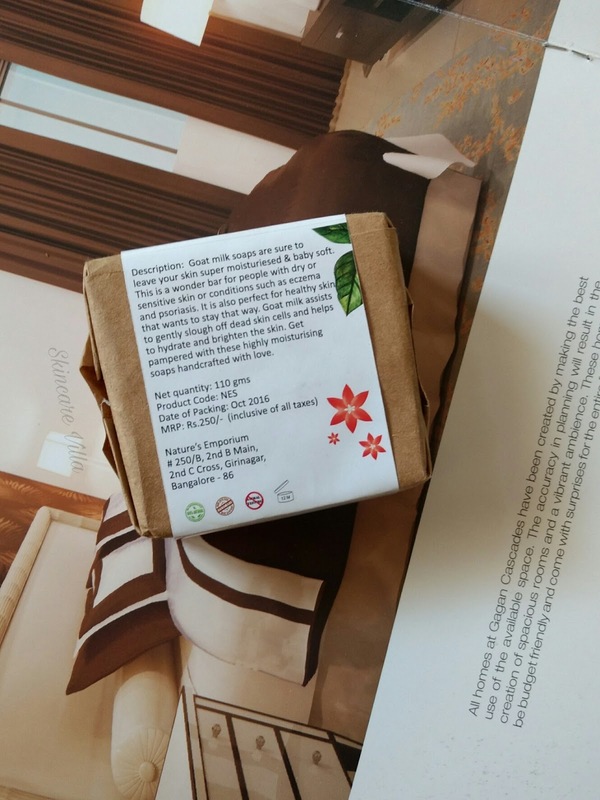 As you can see in the images above the soap is packaged in a cardboard packaging with the brand label over it. If accidentally the packaging is torn by sharp objects then the soap is exposed to the environment. So I would prefer another palstic packaging inside since the cardboard is not hard cardboard. Now coming to the colour of the soap it is yellow but smells like a ginger, yes you read it right. The fragrance is more of woody, spicy, but is not at all bothering. 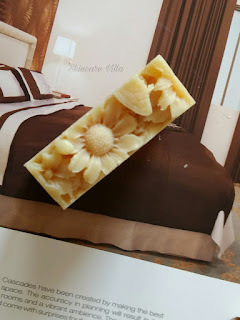 I totally loved the floral design above the soap and everytime I use it, I make sure not to use that side of the soap to keep the design intact 😂😂😂. After using the soap, I knew it is mildly fragrant and doesn't linger much. Now coming to the job it does, the soap foams quite well, cleanses the skin well and gets washed off easily. The foaming is frothy and creamy unlike commercial soaps which take a lot of time to get washed off. The soap doesn't dry out the skin at all, rather it leaves a silky feeling after being washed off. The soap effectively removes oil and sweat and leaves the skin fragrant. The soap unlike other handmade soaps, doesn't turn gooey immediately with one use. Over a period of time it gets a bit frothy if not dried properly. I totally love this soap. 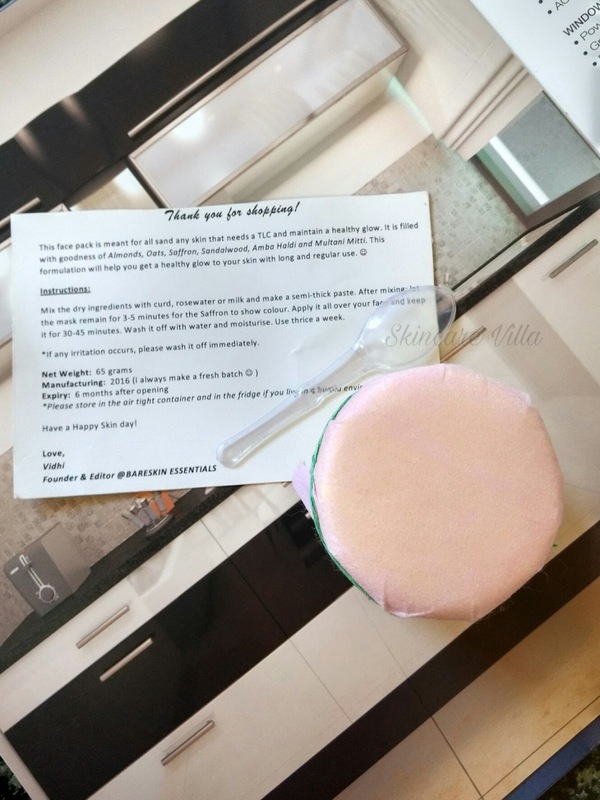 The soap is quite big and would like around 2 months if used by a single person. Now regarding the price, the soap is totally worth the money, but quantity offered at this price would have been more. Do try the soap once if you get a chance. Price, Shelf life and Availability - 250 INR for 110 gms and Shelf life of 12 months. Available for orders on The Nature's Emporium Facebook page. 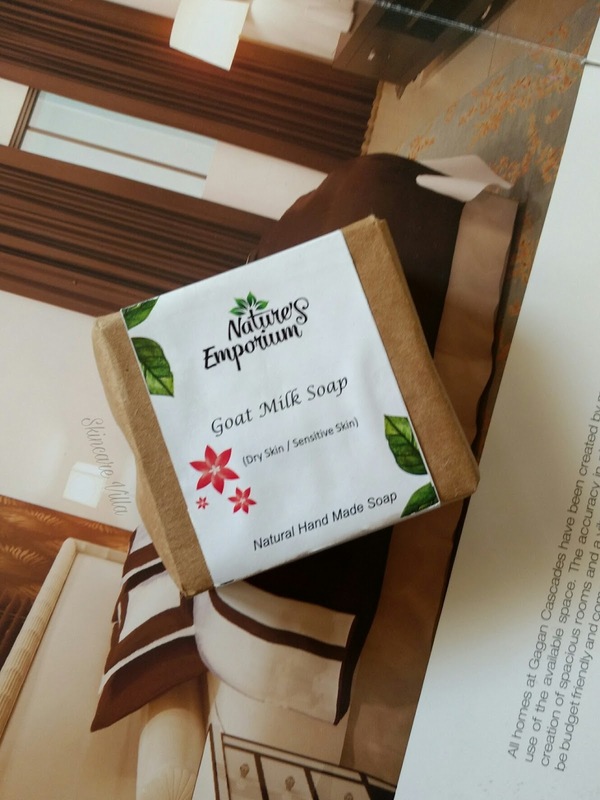 I would totally recommend The Nature's Emporium Goat milk soap for all handmade soap lovers. Good quality, affordable price makes this soap a winner. Although the quantity at offered price can be a bit more. 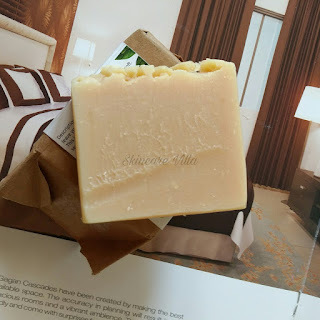 If you haven't switched to handmade soaps then you definitely need to give this a try. You will never regret the decision of using handmade soap, I can definitely bet on this 😃. Cleansing milk, face wash, face packs, I love experimenting with these skincare products. I usually try different face packs more than any other skincare product. 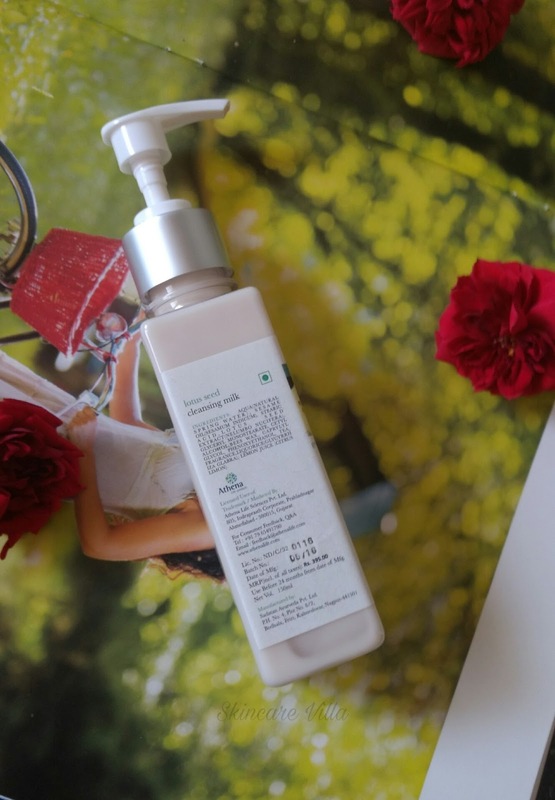 In case of Cleansing milk, I have tried only a few to name Himalaya Herbals Cleansing milk and Ayur Herbals Cleansing milk. 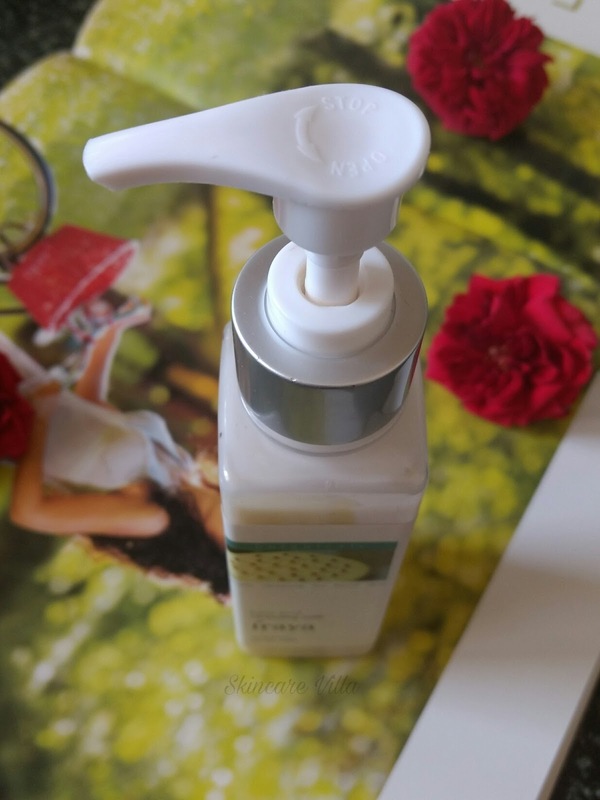 Today am going to review Iraya Lotus Seed Cleansing Milk. Yes I know the Lotus Seed ingredient might have excited some of you. So let's straight head onto the review. With Lotus seed and Liquorice extracts, this cleansing milk easily penetrates the skin, cleansing the pores from dirt, makeup and pollutants,. Gently balances skin's oiliness and helps to retain its natural moisture level. An ideal makeup remover. 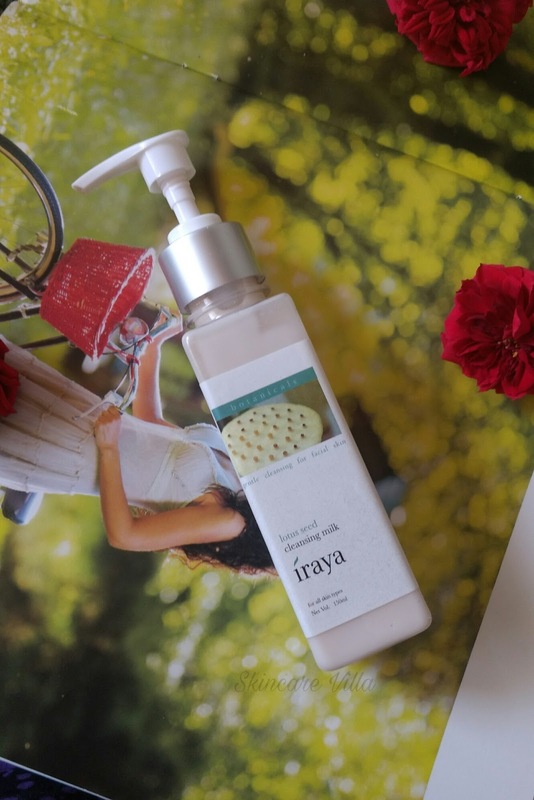 Iraya Lotus Seed Cleansing Milk is thin and runny is consistency and milky in texture. The cleansing milk is of ivory colour and has a sweet floral fragrance. The fragrance is a bit lingering in nature, nonetheless it is mesmerizing. You can keep on smelling, in spite of having a picky nose. I love the smell to the core. The cleansing milk being runny in consistency spreads easily over the face and neck 😃. A very small quantity is required due to its consistency. The cleansing milk gets absorbed easily, so we just need to dab it. The cleansing milk effectively removes dirt, grime and sebum. The skin is left squeaky clean and fresh. However the skin feels soft and moisturised. The cleansing milk leaves the skin a bit waxy. The cleansing milk has lotus seed and Liquorice extracts which are beneficial for the skin. So in the long term it might be helpful for the skin. The cleansing milk effectively removes light makeup and lipstick. I never use heavy makeup so cannot comment on that point. Below you can see swatch of kajal, Maybelline lipstick and BB cream to get an idea on how the cleansing milk fairs with makeup removal. Overall the cleansing milk is a good choice for daily CTM purpose. Price, shelf life and availability - 395 INR for 150 ml with a shelf life of 2 years. Available on Athena Life website as well as major skincare shopping portals. 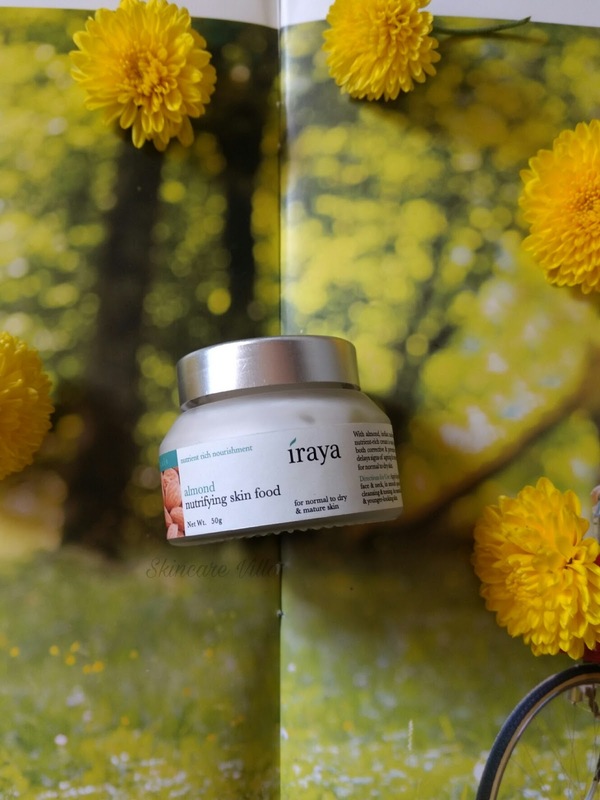 I would highly recommend to try Iraya Lotus Seed Cleansing Milk as a change which has lesser chemicals than the popular ones. Moreover the formula is paraben free. The only problem might be non travel friendly packaging. Overall the product lives up to its claims and is a good choice for daily use. I might repurchase this after this product is over. I haven't tried many body butters till now. A major reason being usage of handmade soaps. Handmade soaps don't strip oil from the skin and hence my skin doesn't end up being dry. But yes, using body butters once in a while is good for the skin . Today's review is about a product by new brand called The Nature's Emporium. After reading one of my soap reviews, the owner of the brand got in touch with me for a review 😊😊. The product name is Butter Me Up which is a body butter. Nature’s Emporium offers you a bouquet of Pure, Natural, Handmade products. We create soap and skin care goodies to pamper your body in the simplest way we can - using 100% natural ingredients. Just the simple goodness from the earth that makes your skin healthy and happy, refreshed and nurtured. We began this exciting journey in July 2016 by making soaps. When it comes to creating great quality soap, method is everything. We use a traditional cold process method of soap making - a centuries old technique which has the added benefit of being energy efficient. In less than 3 months we have over 10 variants of Natural Soaps along with over 10 other bath & body essential products which are Natural, Pure, Handmade and made in small batches. These products are anhydrous and hence need no preservatives and are free from sulphates, parabens and other harsh chemicals. 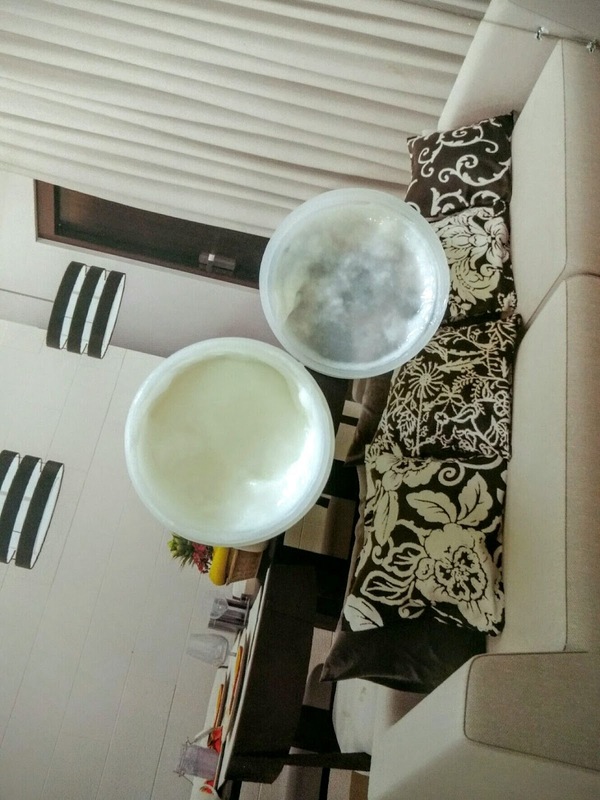 The body butter is packaged in simple plastic tub with a plastic screw up top and inner lid to prevent leakage. The tub is not heavy sort and is easy to carry. The body butter is super white in colour and smells amazingly of roses. However you immediately pick the fragrance to be a bit artificial. After my first use I immediately knew that rose fragrance oil was used in it and not essential oil. The fragrance is a bit bothering but doesn't linger much after applying. The body butter is of thick, fluffy consistency and resembles exactly that of a cake cream. 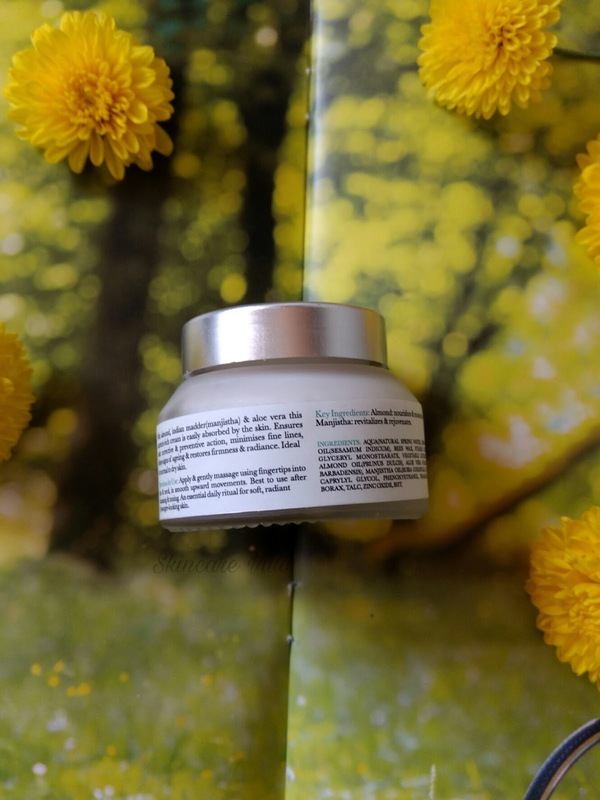 The body butter melts when it comes in contact with body or higher temperatures. Please don't be tempted to eat it 😞, I have somehow controlled my temptation. 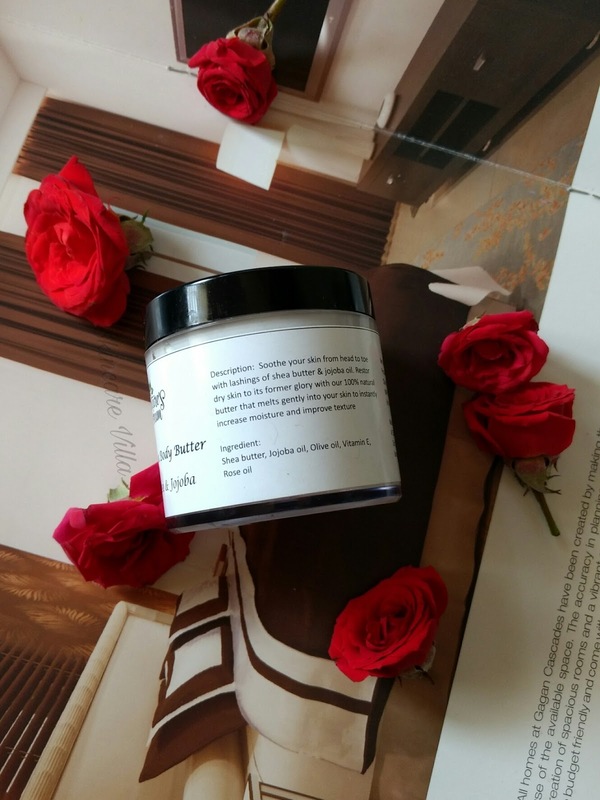 Now coming to the business part, the body butter moisturizes the skin very well. The moisturization effect lasts for about 10-12 hours. After that time, the skin looks hydrated and soft, no dryness or need to reapply us felt. I use handmade soaps and hence the moisturization isn't stripped. Some of you, who are into commercial soaps or shower gels may feel the need to reapply. I apply just once per day and it is sufficient for me. 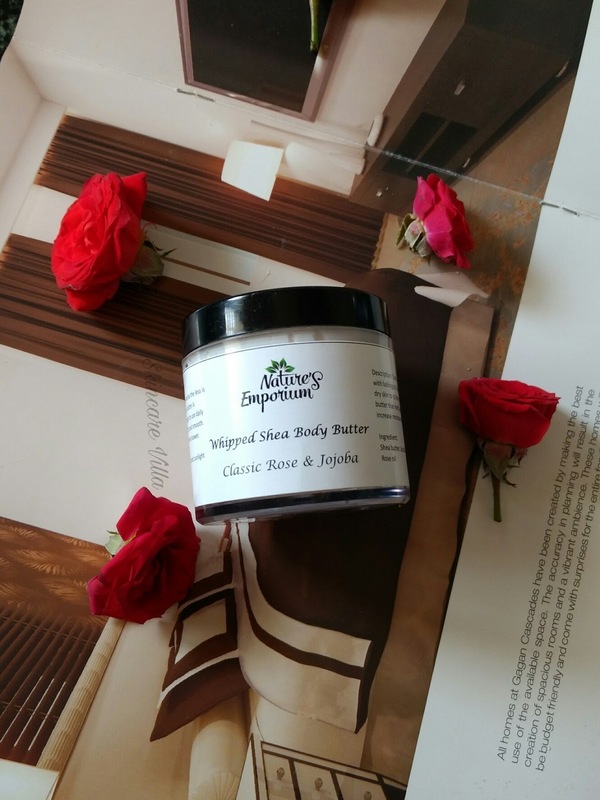 At first the body butter doesn't get absorbed into the skin and needs to be massaged well. Post massage, it gives a little oily feeling to the body for about 1 hour. After this your skin feels comfortable and feels buttery soft, smooth and hydrated. As per the product claims, a little goes a long way, holds true in case of this body butter. I need only 2 dollops of body butter for my hands and feet, so 100 gms would last longer than expected. Overall a good body butter to try this winter season for a change. Price, shelf life and availability - 750 INR for 100 gms with a shelf life of 1 year. Available for order on The Nature's Emporium Facebook page. 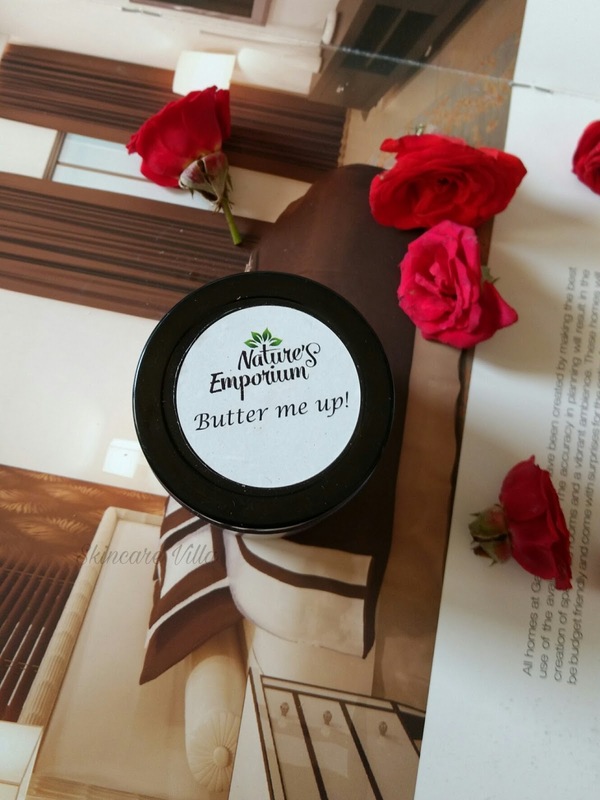 I would recommend The Nature's Emporium Butter Me Up body butter for dry skin and for winters. It intensely hydrates the skin making it soft and smooth. However it does give a little oily feeling and the fragrance is a bit bothersome. Apart from that the body butter is a good option to try out this winter season. 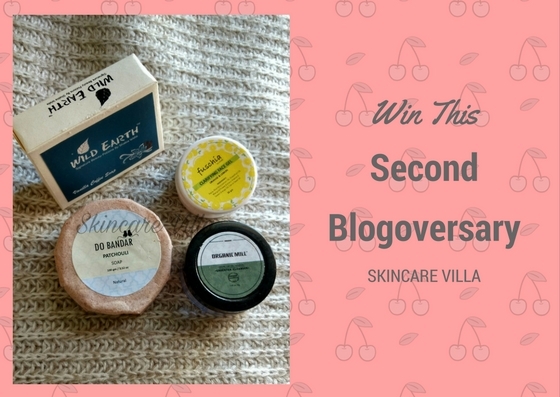 I am very delighted to tell you all that SkincareVilla has completed 2 years on 9th December. A blog which was started simply as a hobby, has become a part and parcel of my life now. In 2 years of journey the blog has undergone many changes right from Blog name, domain to the latest one being the theme of the blog. Still I have a long way to go and hope to keep on blogging for many more years. As of now, Cheers to the 2 years!!! I would like to thank all my readers, fellow bloggers, family and friends fr being with me in this journey *wipes a silent tear*. I would specially like to mention my husband who not only supports my love for writing but also encourages me to do so every time I am weighed down. 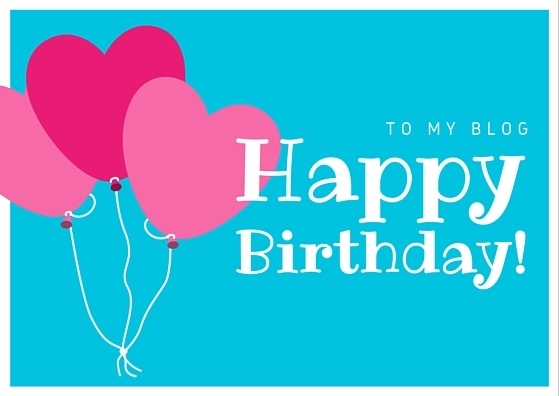 Also some of my fellow bloggers have become my real friends and I would like to thank them for their support. I have used other products from all the above brands and all are natural and popular brands in handmade category. So fill in the Rafflecopter form below and stand a chance to win all the handmade goodies. Please read the terms and conditions also. The place where it says "Visit page on Facebook" in the RaffleCopter widget you should "Like the Facebook page"
Giveaway is not sponsored by any brand, goodies are bought by me. Winner selection will be final by me. Please don't tell me to choose you. Courier will be sent by me and in case of loss or damage during the transit I won't be held responsible and won't be able to send it again. I had always wanted to try Votre brand and my dream has come true with VanityCask subscription box. 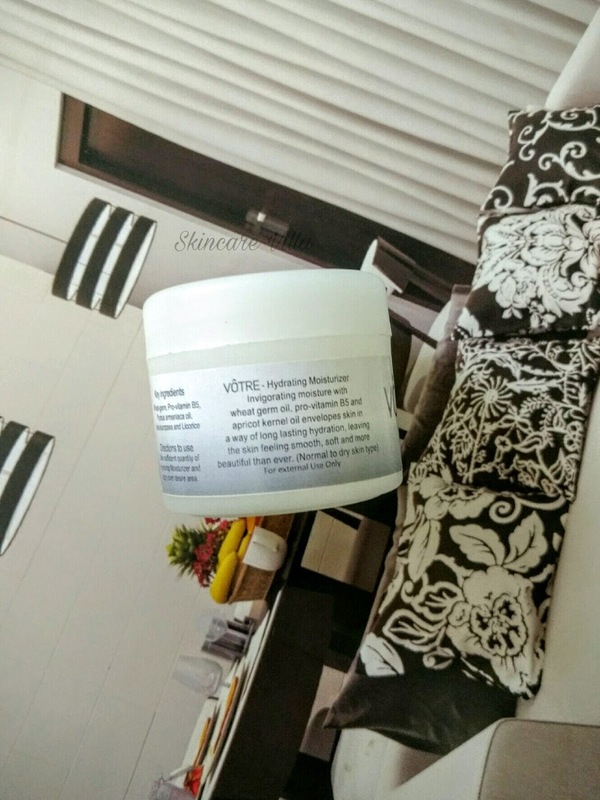 I received a 50 ml sample of Votre Absolute Hydration Moisturiser in the first VanityCask subscription box and after using it for around 15 days am posting my review. Brand claims - Absolute hydration is a rich, yet light weight lotion that helps revive dry, dehydrated skin with a bust of invigorating moisture.Nourishing wheat germ oil, pro-vitamin B5 and apricot kernel oil envelopes skin in a way of long lasting hydration, leaving the skin feeling smooth, soft and more beautiful than ever. Recommended for Normal to dry skin type. Key Ingredients -Wheat-germ oil (Vitamin E), Pro-vitamin B5, Prunus armeniaca oil (Avocado oil) and Glycyrrhiza glabra (licorice), Base q.s. 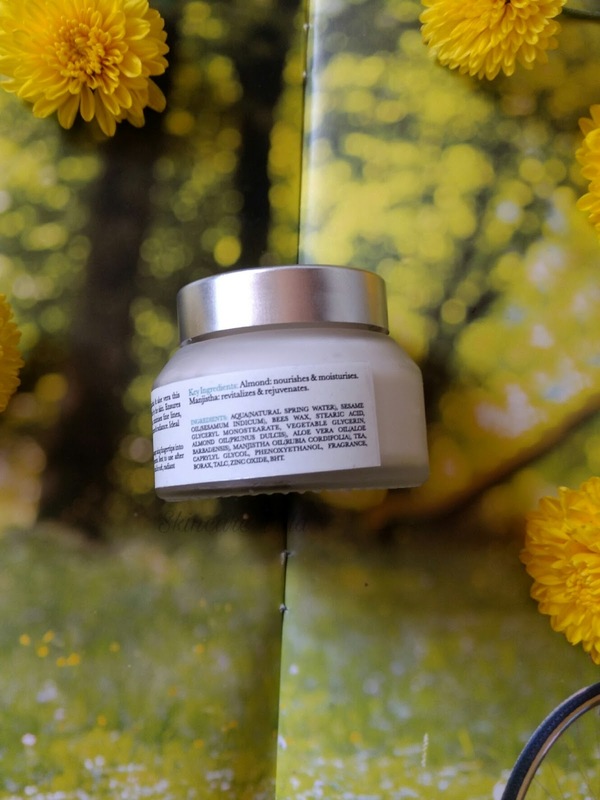 The moisturiser is packaged in a plastic jar packaging with a twist cap. Mine is a sample sized product, but the full size is packaged in a pump up bottle pack. 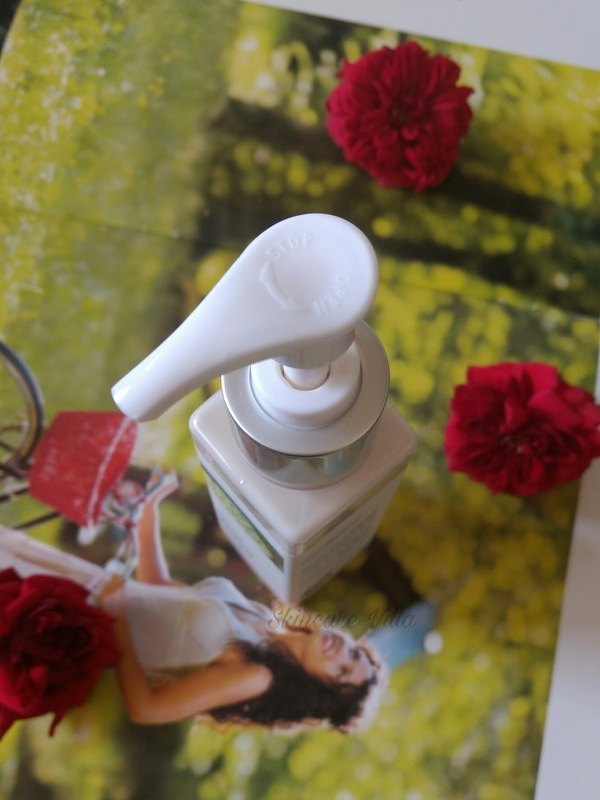 The moisturiser is milky white in colour and has a subtle artificial fragrance. The fragrance is not at all bothering and remains for some time after applying the moisturiser. 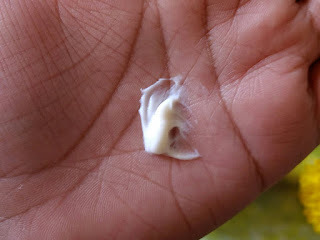 The texture of the moisturiser is a bit grainy and consistency is very thin, rather it is somewhat like lotion. The moisturiser is light weight and spreads easily on to the skin and gets easily absorbed in the skin. It doesn't leave an oily residue behind. One day in a hurry I applied excess quantity and was roaming outside the whole day, still the moisturiser didn't make my skin look or feel oily. A little more quantity of moisturiser is required for the whole face if you have a dry skin. Oily and normal skin are good to go with less quantity. After applying the moisturiser for sometime we feel that something has been applied to the skin. The skin feels hydrated, smooth but not even toned. The cream hydrates and moisturises the oily skin sufficiently. However the facial skin doesn't plump up or is even toned after applying this moisturiser. Skin feels smooth and soft after applying. I have also used it during day and night and it works perfectly fine. I have oily skin and it didn't break me out or didn't make my skin look or feel oily. The moisturization provided by Votre Absolute Hydration Moisturiser may not be enough for dry skin. Dry or normal skin may need a heavy formula for complete hydration. However it perfectly suits oily skin and am happy with the results. Also the fact that this moisturiser just provides moisturization, no other added benefits such as anti ageing, pigmentation. But yes it contains wheatgerm oil and pro vitamin B5 which are considered good for the skin. 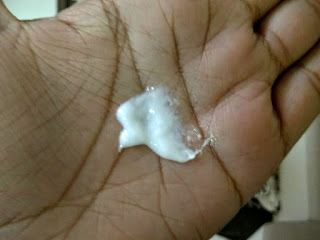 Overall a basic moisturiser for oily skinned beauties. Price, Shelf life and availability - 475 INR for 200 ml with a shelf life if 3 years. Available online on major shopping portals. 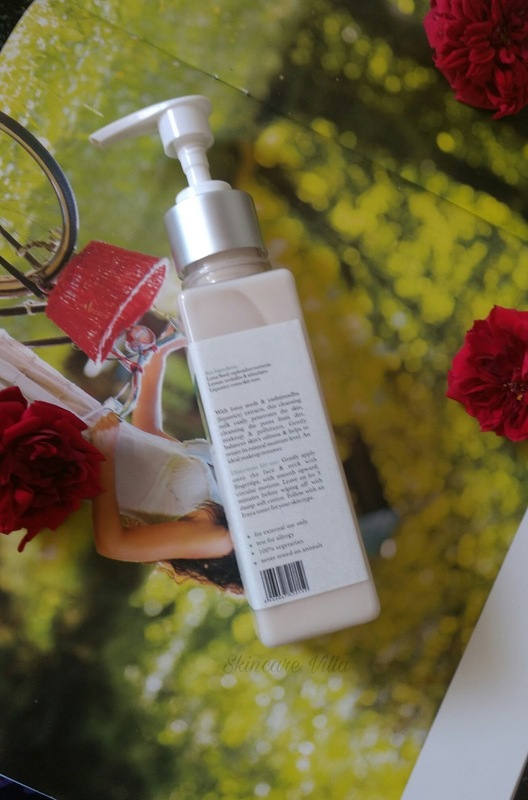 I would recommend the Votre Absolute Hydration Moisturiser for oily skinned beauties who are looking out for basic moisturiser for all around the year. It may not suit dry or normal skinned beauties as the moisturiser is very lightweight and won't provide sufficient moisture to the skin. 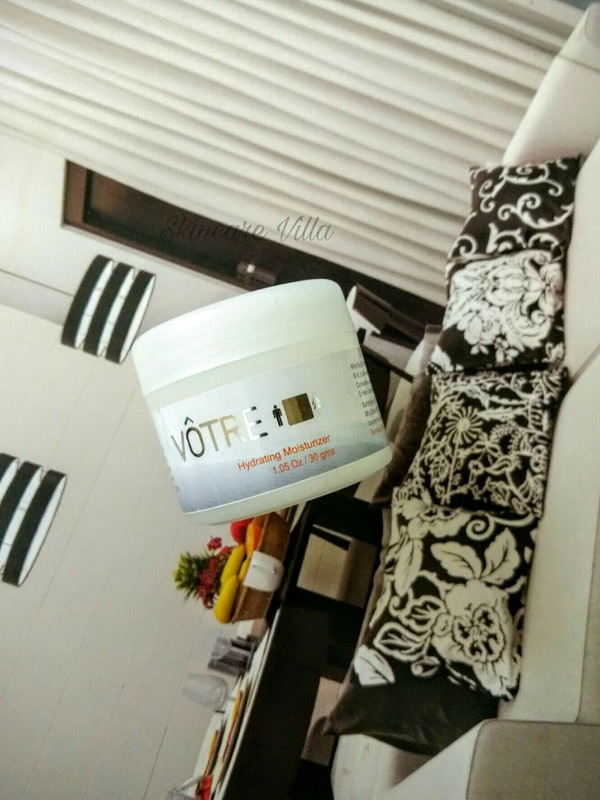 It contains some skin loving agents and is a good moisturiser, if you haven't tried any product from Votre then you can get started with this one and you won't be disappointed. We have heard of lip balm, lip butter, lip revive. 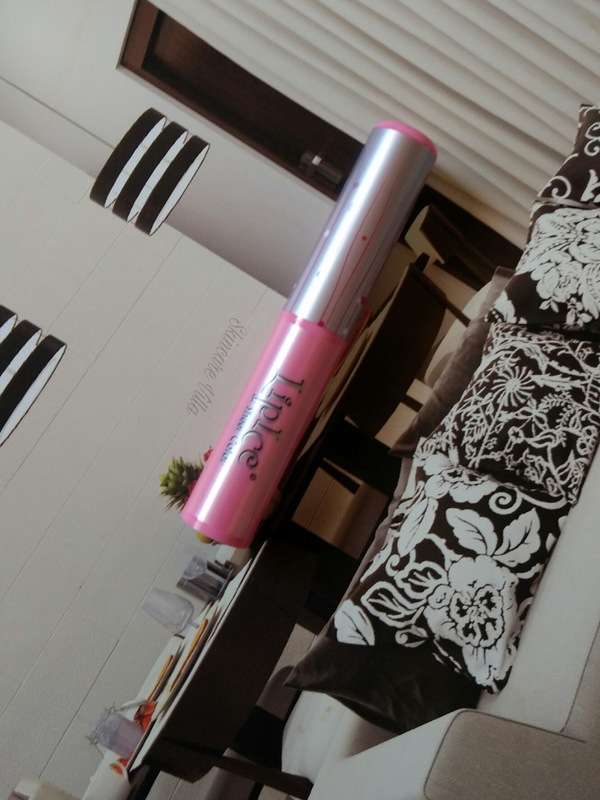 Today's review is about a butter gloss which is a lip butter which serves the purpose of a lip gloss. The Nature's Co is a vegan, Indian brand which has products ranging from skincare to Haircare. 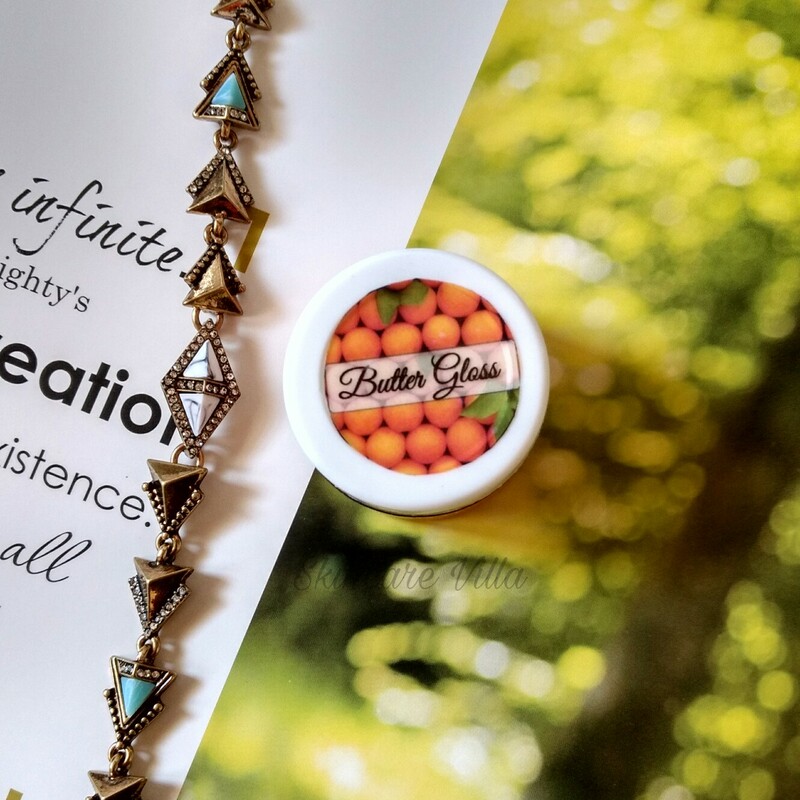 Let's head on to the review to see how their orange Butter Gloss fairs on its claims. 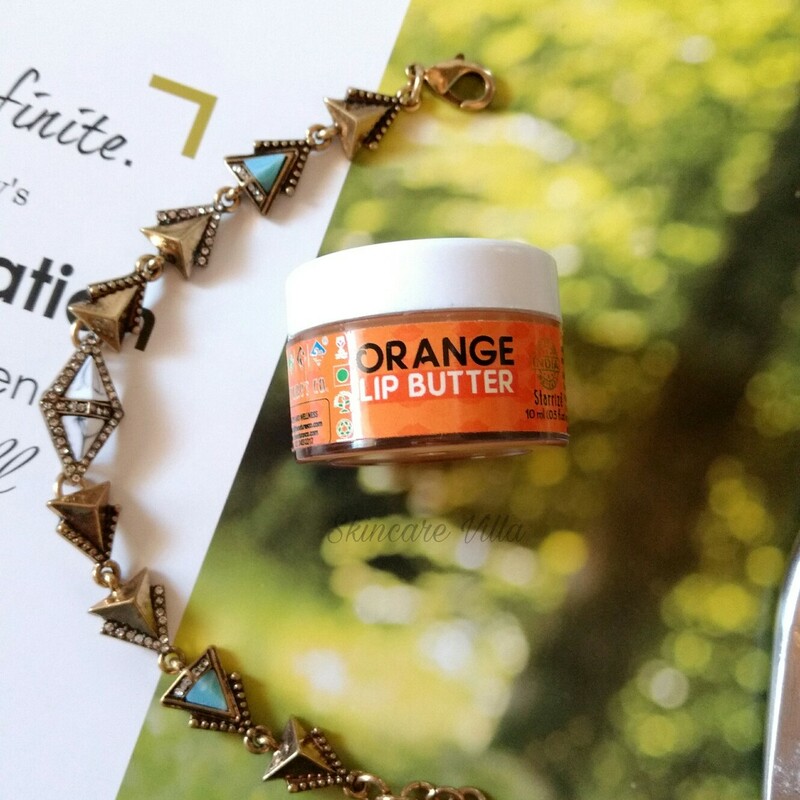 Brand claims - Get delicious, soft and luscious lips with our Tangy Orange Lip Butter . It promotes collagen production and soothes dry, irritated and cracked lips all day long. Apply directly to your lips, as often as required. Ingredients - Orange Flavour, Kokum Butter, Shea Butter, Mango Butter, Castor oil, Vitamin E.
The butter gloss is packaged in a small plastic tub. The tub is thick so as to prevent any damage due to dropping or otherwise. The tub has an inner pull up lid to prevent the product spillage, however the product is frozen and won't spill I think, at least in winters. Now coming to the fragrance, it has authentic orange flavour and the fragrance is quite strong. I have a picky nose and I don't like strong fragrances. However this doesn't linger that much so it's not a problem. The colour of the butter gloss, as guessed from the name is orange. But after applying on the lips it's not orange at all . Now the business, the butter gloss glides like a charm on the lips and instantly makes them smooth and shine. The butter gloss melts a bit when it comes in contact with the normal body temperature. A very little quantity of butter gloss is required for each usage and this will last for me like forever. Whenever I apply a lip product in the morning I never reapply again on that day. And according to that this will last for ages. Now the durability, the lips stay moisturized for whole day and chapped lips are healed instantly. It makes the lip soft, supple, smooth healthy looking. Now the gloss part, the butter gloss actually imparts a gloss look to the lips and makes them shine. I was totally floored at the sight of my lips 😊. It keeps the lips moisturized for about 8-9 hours, and I didn't feel the need to reapply. But some lip balm addicts make feel the need. It can also be used over a lipstick impart a gloss effect. I would highly recommend The Nature's Co Orange Butter Gloss for it efficiency. Can be used as a gloss over a lipstick. Price, shelf life and availability - 395 INR for 10ml. Available on thenaturesco.com as well as major shopping portals. I would recommend The Nature's Co Orange Butter Gloss for its effectiveness. It makes lips smooth, soft and supple. It heals cracked, dry and chapped lips. The product lasts longer as a little quantity is required each and every time. Moreover the brand is vegan and Indian. However some may find it a bit pricey, but the product is totally worth the price. 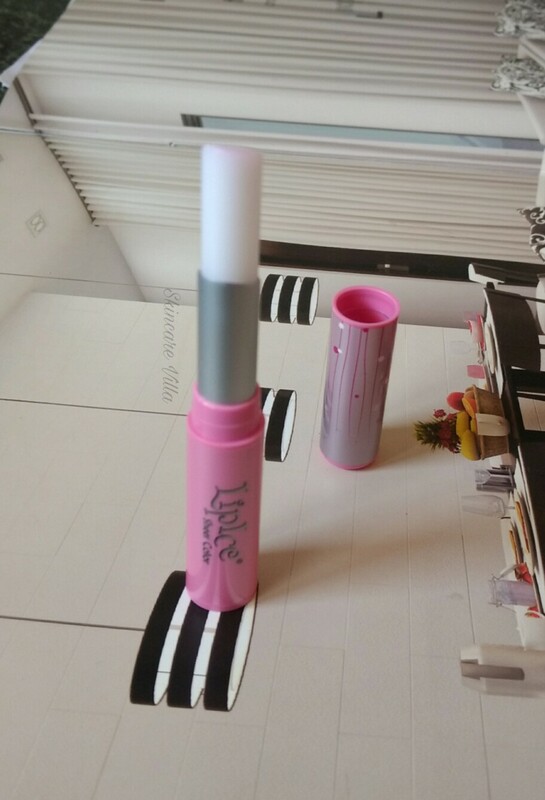 If you are into luxurious lip care products then you cannot miss out on this one. Festive season just calls in for some shopping. I know many of you would agree with me. Festive season brings in some cherished memories from past and some memories to make for the future. As you go down the memory lane all we remember is the cheer and happiness the festive season brings in. So for making the best of memories we also need to look our best 😀. 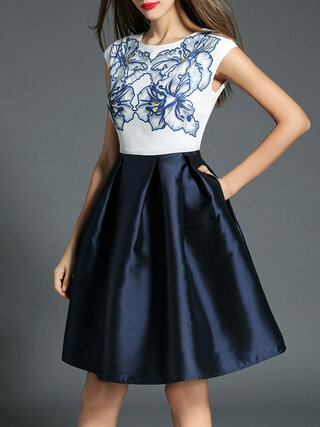 At StyleWe, we believe that every customer should truly enjoyDesigners at Your Fingertips. Hope you all love my picks. 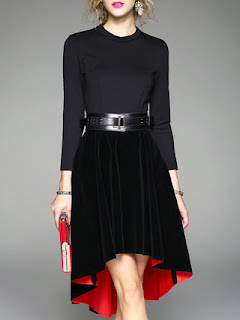 They also have maxi skirts those who love flaunting them, also buy dresses for Black Friday. Apart from dresses they also stock up on bags and men's fashion. So head onto the website and discover your own style.